The Audi A6, A7, A8 and Q5 get new plug-in tech, dubbed the TFSI e.
Audi is going to electrify the A6, A7, A8 and Q5 with a new plug-in hybrid powertrain. The four new models will go on sale later this year in global markets, but they will be showcased to the public at the upcoming 2019 Geneva Motor Show. 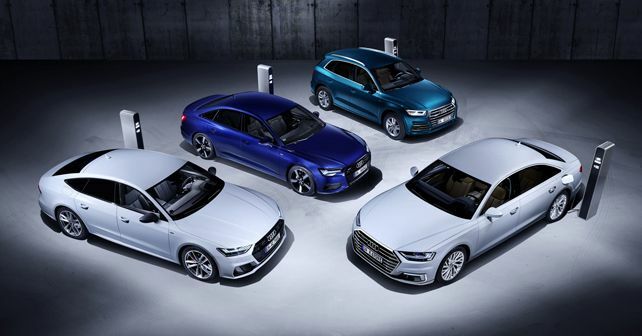 The plug-in hybrid derivatives of the four models will come badged TFSI e. With the A6, A7 and Q5, there will be two engine variants on offer – 50 TFSI e and 55 TFSI e. The former will get the company’s 2.0-litre turbocharged four-cylinder petrol engine, which will be mated to a gearbox-mounted electric motor. Power output will be 291bhp along will a torque of 450Nm. The 55 TFSI e will feature Audi’s 3.0-litre, V6 turbo petrol, in conjunction with the same gearbox-mounted electric motor, developing 357bhp and 500Nm of torque. Both the new plug-in powertrains will be paired to a seven-speed, dual-clutch automatic gearbox. All-wheel drive quattro is standard. The new A8 hybrid comes in two power outputs – the same 55 TFSI e as above and a more powerful 60 TFSI e variant, which uses the same 3.0-litre V6 setup but churns out 436bhp and 700Nm of torque. The A8, however, will use an eight-speed torque converter automatic gearbox. All these models get a 14.1kWh lithium-ion battery pack, mounted under the boot floor. In all-electric mode, the cars will have a range of 40km. Speaking of driving modes, there are three on offer – EV, Auto and Hold. EV mode is all-electric, Auto is a hybrid drive where both the petrol and electric powertrains work in tandem, while Hold is a power-saving mode. Audi will offer a compact charging system as part of the standard equipment, but customers will also get the option to use a wall-holder clip and a mode 3 cable for public charging stations. Using a charge connector with an output of 7.2 kW, it'll take around two hours to charge the battery pack.